At the end of Season 3 of ABC TV Series SCANDAL, I called for an end to the show; it has drifted from EXCELLENT at the end of Season 2 to MEDIOCRE during and ‘til the end of Season 3 (Cancel SCANDAL). I did however see an opportunity for Ms. Shonda Rhimes, SCANDAL executive producer, to salvage the show the following season. During an interview, Ms. Shonda hinted at bringing back Olivia Pope & Associates, something that was completely missing in Season 3; I cheered that SCANDAL will indeed be back in Season 4. For an episode or two, it seemed that’s Ms Rhimes made good on her promise. Quinn’s investigative instinct located and contacted Olivia who had disappeared (at the end of Season 3) with her boyfriend Jake to an undisclosed island. Olivia returned to Washington, contacted Huck who worked at an electronic store and Abby who works as White House press secretary; they all joined in to pay their final respect to their colleague (Harrison) who was fatally shot and died. Following Harrison’s funeral, Olivia decided to stay in Washington. She re-opened Olivia Pope & Associates whose principal job is to help high profile clients “weather” scandal and public humiliation. From the few cases she handled during Season 4, Olivia Pope who is supposed to be in control, who is supposed to know and anticipate everyone’s move, “was easily played” by her clients. As if that’s not humiliating enough, (not for the characters in the show, I can say that much), when Olivia’s father (Rowan) turned the table on Jake, Olivia’s boyfriend, as the person responsible for the death of the first family’s son, Fitz decided to personally deliver the punches that turned Jake into a human punching bag. The President punched Jake so many times that his knuckles were broken. Shonda meant for that scene to be a scandal; it was nothing but; it was ridiculous. But that was not the only humiliating scene – meant to be a scandal – that Ms. Rhimes misconceived; Mellie, the other character who helped shape SCANDAL in the first two seasons behaved much like a homeless woman, a deranged lunatic instead of a grieving first lady. Ms. Rhimes meant that scene to be a scandal as well but failed miserably. While Mellie’s weird behavior does not fit a first lady, as a grieving mother, she would be given a pass anyway. The scene was more humiliating for Ms. Rhimes than it was a scandal for the office of the presidency in the show. Even the scene of the vice-president who framed a foreign entity in order to force the president to go to war could not be exploited by Ms. Rhimes’ creative mind as a serious scandal in Washington. The only character Ms. Rhimes preserves during the otherwise most humiliating season thus far is Rowan, Olivia’s father, head of B6-13. Jake who should have disappeared from SCANDAL a long time ago, well in the beginning of Season 3, is being dragged around like a rag that fits nowhere. There are rumors that the only reason the Jake character has survived for so long is because Shonda has a crush on Scott Foley. While we’re not able to confirm (or deny the rumors), it seems to fit the bill in this case. Be as it may, SCANDAL excellence in the first two seasons hinged on very specific characters, Olivia Pope & Associates, Fitz the President, Mellie the first Lady, Cyrus the chief of Staff, and Rowan, head of B6-13. 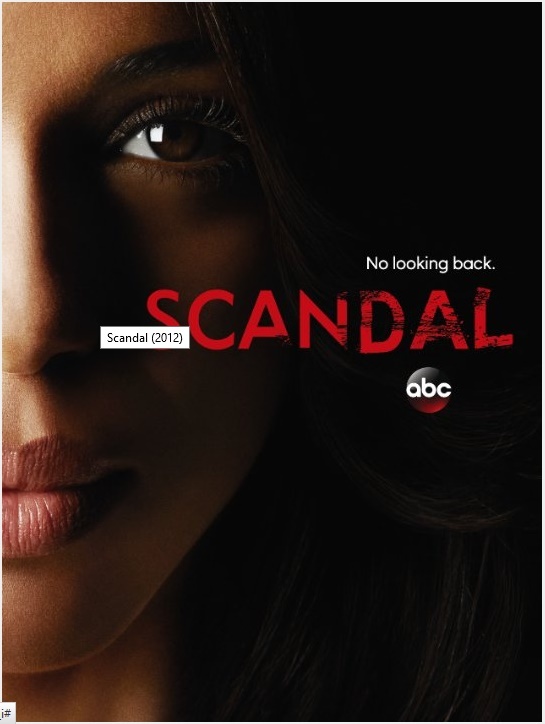 But what gave SCANDAL an A+ rating in the first two seasons is Olivia’s ability to rally her associates to handle high profile cases (and win) and have an affair with the President at the same time; added to the mix Mellie’s boisterous character who wants to stay first lady at all cost, put an end to her husband’s roving eyes and preserve the relation the White House has with Olivia for the occasions when her service may be needed; and of course, B6-13 that pops in and out to steer things in the proper direction in order to protect the Republic. All that had disappeared after Season 2. That should have been the end. ABC should now pull the plug on SCANDAL; it has fallen off the cliff. I cheered too early, too soon. While Ms. Rhimes is no stranger to mediocrity-ville, having been nominated in 2003 for a Razzie Award for Worst Screenplay for the 2002 Britney Spears film Crossroads, it is a town she left behind a very longtime ago. There is very little doubt she would not want to travel anywhere near that town again; for that reason alone, Ms. Rhimes should decline to continue the SCANDAL TV series. Mediocrity-ville is within sight in SCANDAL. It is beyond salvage. It is RIDICULOUS! Is Season 3 the End of SCANDAL?